Have you ever seen a deer in the headlights? They freeze up. Is your company like that deer? Or are you the headlights? Listen in as Karla and Allen discuss the differences between getting your Block Busted and putting your Flicks on the Net. 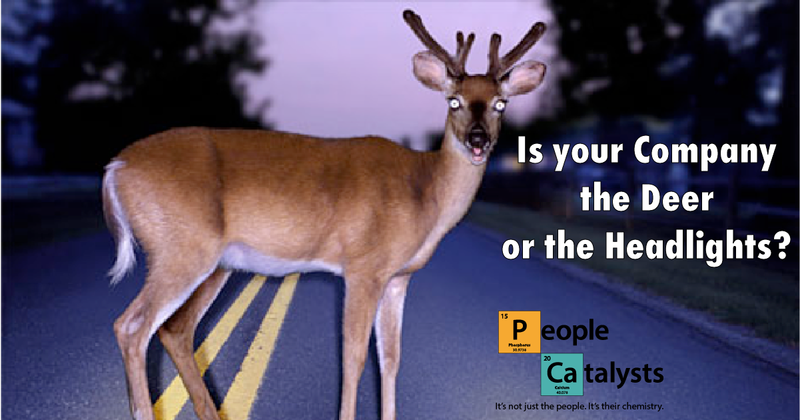 Are you a “Deer” Company or a “Headlights” Company? Karla Nelson: Hello, good day, sir. How are you? Allen Fahden: I’m outrageously well, thank you and happy to be back on the podcast trail again. Karla Nelson: Well, I’m really excited about what we’re going to talk about today. First of all, because I grew up in rural South Carolina so you can imagine what the deer in the headlights means to me. Simply because there’s been more times than not that I have the pleasure of hitting a deer that ran out and stopped right in front of your track. So what we’re going to talk about today is are you a deer or a headlights company. So of course, deer as we all know are notorious for crossing roads and as soon as the headlights hit their eyes, then they can’t see effectively because the pupils get too big and they just stop and they freeze. And so we’re going to talk about what different attributes a deer company would look like that would stop and just freeze in front of a moving vehicle towards you and then a headlights company. So we’re going to go through a few real life examples of both companies that we worked with and that are household name companies because they’re easy for people to understand and then we’re going to identify four very specific things that if you were a deer company, what that looks like, and how you can be a headlights company. And so we’ll start with the first really important thing that you have to be aware of of how a deer company acts and how a headlights company acts in regards to ignoring change, or to sometimes people call it innovation. But we’re just chatting not too long ago, Allen, and you were identifying that innovation is just being the first one. But everybody still ends up having to change. And so one is ignoring change or innovation, are moving too slowly, and then the other would be to embrace innovation, embrace the fact that things do change. We’re hearing this all the time with different technologies and companies right now. Not only how to adapt to AI and machine learning, blockchain. Sometimes it’s just using a new software in order to get or have the ability to get, I mean, heck, even social media, you can bring it down to pretty much every area of our business now has some type of technology and it’s not slowing down if you had noticed. Allen Fahden: Yeah, that’s for sure. Karla Nelson: This one really remembers, we should share with the listeners the story of Blockbuster because that was, I think that is a whole story left. Allen Fahden: Yeah. At one time, they had what, 600 of them? Allen Fahden: 9000. I’m thinking of somebody else. Yeah, that’s right. 9000 stores. They dominated the video rental business. Karla Nelson: Yeah. They’re the big boys on the block, and now they have one store left in Bend, Oregon. They had four stores last year. They just closed two in Alaska. Allen Fahden: Their block has been busted. Karla Nelson: Yeah, no kidding. Well, and so of course change was coming. We’ve got now look at how many platforms are out there. But Blockbuster truly said “Hey, we’re the big boys. Everybody’s always going to want to go buy their popcorn and their candy too.” And they completely ignored it. It’s interesting how the one last store in Bend, Oregon has actually innovated why somebody would go into a Blockbuster as well. Allen Fahden: Well, it is interesting because they didn’t have to do anything to make this innovation. They just kept all the stuff they had from before and now you can find movies that you can’t find streaming because nobody bothers to stream them perhaps. Karla Nelson: Now I do believe, aren’t they working with other platforms to livestream those types of movies because they can’t get them anywhere else? Allen Fahden: Yeah. Dish has an agreement. I think they’re licensed in the Blockbuster name. Karla Nelson: How interesting is that? So Blockbuster had 9000 stores completely ignored the fact that change was coming. They were the big boys, everybody was going to get their popcorn and their candies so they would always have a retail space available and the one last store that stands figured out a little bit of the niche to go after which is all the movies that you can’t get on livestream. Allen Fahden: That’s right. They stayed open after the Blockbuster store in the north pole closed. Karla Nelson: Yeah. That’s right. That was the other one. There was two in Alaska and one in the north pole that closed. That’s saying something right there. Okay, so that is what a deer company looks like when they’re ignoring change and innovation and you especially see this with the large companies because change is very challenging for them and they feel like they’re the big on the block as well. But let’s take a look at the other side of that. A headlights company in the same vertical that embraces innovation. Not only did they innovate but they actually have embraced change because they’ve re-innovated themselves since 1997 and that’s Netflix. Allen Fahden: That’s right, and if you take the number of times that Blockbuster innovated, reinvented themselves. That’s probably zero or less, and if you take the amount of time to Netflix reinvented themselves, it’s like three or four times. Netflix has completely reimagined themselves several different times. Karla Nelson: Yeah, I remember when everyone said they won’t do well at all. Mailing DVDs, but guess what? They did it because the biggest thorn in Blockbuster’s side, myself included did this all the time, so I would just buy whatever DVD, was not return it in time, and then you had all these late fees. Their balance sheet was not in alignment with what customers wanted, it was because they had to use them. They had to go to Blockbuster, that’s all that there was. Allen Fahden: They would make money by causing misery for their customers. Allen Fahden: Because nobody likes paying a late fee. Karla Nelson: They made more money on the late fees whereas Netflix, remember, they’d say here’s the DVD keep it as long as you want. You’d get so many over certain of time, and then mail them back to me, which is actually easier to just drop it in your darn mailbox than to drive all the way down to the retail store unless you lived really close, I did lived close to the Blockbuster I went to so I always got the preview DVDs, I got a million DVDs now because I would never rent them, my brother pay two more bucks and not have the late fee. But then Netflix did, then they went to livestream. So they weren’t sending out the DVDs, I think for a period of time, they did both and they allowed people to choose which one. They wanted to look at, and then they even further innovated from there. So licensing from distribution partners, so it was. Allen Fahden: Producing their own content. Karla Nelson: Yeah, and now it’s like wow, so they license stuff first, so that they could get their hands on other content and now they’re actually producing their own movies. They’re producing their own series, and you look at some of them are really popular. But they’re still licensing others as well. Allen Fahden: It’s interesting too because you’d always pay a subscription to them so they’d always have a very even cash flow, great business model, and why could they have a subscription for somebody like maybe a Blockbuster couldn’t. Well, one thing is they had enough customer satisfaction that they’re worth paying a subscription for. You wanted what they add, and they took care of you. Karla Nelson: Yeah. The only thing is that darn binge-watching when you find a really good show is such a bugger. Especially when the writers are good and you’re at the end of it, and you know you should go to bed because you got to get up, and you’re just like just one more. Allen Fahden: The sun is coming up. Allen Fahden: One more episode. Karla Nelson: Okay, so again ignoring change and innovation, deer company. Embracing innovation and change, headlights company. So let’s move onto the next area that businesses have challenges with in being either a deer company or headlight company. That is, and we talk about this all the time. Function management versus role management. Function is you got this degree, this is the job description. Go ahead and that’s your job. Allen Fahden: Beginning to end. Karla Nelson: Yeah. Come up with the idea. Run with it. Poke all the holes and implement it. Again 1% of the population is good at that, and then role management which is what we teach which is finding the right person to do the part of the work and having the fit in sequence of each of your team member so that the input matches the output based off of depending if you’re an ideation or an implementation. I know we’ve shared this story before, but now that we’re talking about the last two stores in Alaska. Remember our client in Alaska. Allen Fahden: That’s right. It’s interesting too because if you look at function management, that’s pretty much the management protocol of like a Blockbuster. So if you have a couple guys like Steve and Paul like we worked with in Alaska. You’re going to be like a Blockbuster. Several reasons why, one is neither one of them like their jobs and they didn’t like each other very well. They have a behavioral problem. One of the things that we found out was that Steve is a person that you would call a shaker which means that they like to shake things up with big ideas and they think randomly and they love new things and new challenges. Steve had some of that work in his job but not very much, and then Paul, he used what we call a prover, and a prover is somebody who can look at an idea and tell you everything that’s going to go wrong. Very good at being organize and being patient enough to do some routines and they’re pretty analytical and they can walk around and see what’s going to go wrong. Well, so Paul didn’t like his job very much either and so on closer look, there was a good reason for them not liking their job. Each one of them had two major parts to their job and both these guys had identical work. They were in IT and they both did server maintenance and they both did help desk. So one of the things that became clear when we found out Steve was a shaker was that he probably likes help desk because that’s a new and different challenge everything and we’re pretty sure that Paul didn’t like help desk because provers don’t like to be interrupted. They don’t like somebody coming who will do something new and they just want to make sure that everything is pretty well oiled. And so Paul actually love server maintenance, so what we did. But they were doing about half their workload on each. Now the interesting thing is if Steve had have his workload in server maintenance and half his workload in help desk then he’s going to do help desk really fast and spend probably 10, 20% of his time on it, and he’s going to do server maintenance really slowly because he’s bored to death and he’s going to spend probably 70, 80, 90% of his time on it. So even the workload might have been equal, the time spent wasn’t. Karla Nelson: I think that’s one of the things that a lot of employers and business owners and even honestly team members because we’ve done it incorrectly for so long is that you think you have to be responsible for everything. It’s like wow, we can’t have one person doing something different than the other, that’s not equal. It’s not fair. I think that that mentality, you see that a lot in sales teams. That they have to go get the business, they have to maintain the business. They have to do whatever the service… the followup they have to do, and then they have to maintain the relationship afterward just the fact that most people are not going to do that well all by themselves. It’s just not going to happen and if you can increase productivity, you’re going to increase the bottom line instead of saying no, that’s the way we’ve always done it. But I love Steve and Paul’s story because we talk about culture all the time, and employee engagement and all these really dumb buzz words when you think about it that you just shift something little around and something that seemed like, well, you guys just personally don’t like each other. 70% of you … you can remove 70% of the rub because they think they don’t like each other. They just cross each other out, and they don’t like the same type of work. So that you don’t understand the other person, and you don’t understand the value that they bring. You feel like they’re a thorn instead of appreciating what they’re really good at, and so we just tend to focus on that, and of course there’s always a long standing joke between the provers and the shakers on because they are definitely the most challenging usually, the most different. Allen Fahden: The other thing too is one reason sometimes like other people is when you don’t really like yourself because you’re not doing the work you love. You’re unhappy. You’re miserable. You’re walking around with a miserable expression on your face and your temper is hair trigger. No wonder people don’t get along. Karla Nelson: Yeah. It just shows up in those types of forms and we want to call it culture. We forget culture is what you do, it’s not the pot luck. It’s not any of those things. It’s not the ping pong table. We’re there and the object of the exercise is to get something done, okay. It’s not to sing kumbaya. It’s to get something done. And so we all get things done differently. When you remove that resistance. Now all you had to do is change the part of the work that somebody did. You didn’t have to have a motivational speaker to come and teach us about how culture is really important. All that stuff is good, it’s just that the object of the exercise is not to get along really. The object of the exercise is to get something done. Now that’s a great bonus but when people are happy and they’re doing parts of the work that they love instead of parts of the work that they hate. You’re just going to by default improve the outcome on that. Allen Fahden: The shortest crowd and it’s the one we ignored the most. We just don’t seem to be able to go there. Let’s just rearrange the work so you can do what you love more parts of it that you love, and have more fun doing it, and do it better, and do it faster. No, we couldn’t do that. Let’s not go there. Karla Nelson: That’s just too easy. I always like the one, it’s just not fair. Karla Nelson: It’s got to be equal across the board. I’m like what are you talking about? Allen Fahden: I’m so miserable over here. That guy can’t be happy. Karla Nelson: Yeah, banks are the worst when it comes to it. Because it was always the way it was done, and we always ask the question why do 20% of our sales team do 80% of the work? Well, this is likely a big giant reason why, the 80-20 rule does work but what if you could shift that significantly just by taking away the things that really really keep your people not nearly as productive nor happy. Okay, let’s move onto the next one here. I love this one. The third thing we’re going to talk about here between a deer company and a headlights company is. Allen Fahden: Before you go there. Allen Fahden: One of the things that Steve and Paul did is that Steve wound up doing all the help desk because he loved it, and he put up a sign next to Paul’s door that pointed over to his door that said all help desk support over here. Paul actually hated help desk because like we said, he hated being interrupted but he loves server maintenance. He could walk around the servers, take his time, and just keep it fine tuned to a beautiful, beautiful level. And so what happened is that they each spent way less time doing their parts of the work. Because Steve was doing the help desk which he’s great at. Paul is doing the server maintenance which he was great at. It took them both way less time. They’re both much happier, and they went home happy. Karla Nelson: Yeah. They didn’t have to spend any time around each other either. Even if they did have a little bit of a personality issue. They didn’t see each other anymore, and they were helping each other do the parts of the work that they love by taking away what they didn’t. Allen Fahden: They weren’t as friends after this but they sure could tolerate each other a lot better. Karla Nelson: I love that story. Okay, I knew it so well that I would skip the punchline on you there, my friend. Okay, so the next one. We want to talk about from the deer company versus the headlights company is a business that focuses on the business model versus the work model. We always say here we are moving into the 21st century and the 21st century using a 19th century work style. So I’m going to actually hand it over to you here Allen in regards to a business model and I think the could use a great story we often bring up in our presentations is the very first who do. But again we used to, all jobs used to be primarily manufacturing in some type of food base, but that clearly comes down to manufacturing outside of farming which is kind of funny. The law of the fusion of innovation is based off of farming and farmers using new innovations and then who do, you can go back to Henry Ford, and what he did to reinvent work to go from focusing first on the business model which by the way was not working and I do believe he went broke at least once versus the work model which is how they moved the people around to fit the work and were able to basically revolutionize our country with the automotive industry. Allen Fahden: So the business model, think about it as being external and then Henry Food say they sold, they built automobiles and sold them through whatever dealer networks they could find. The business model is external. The work model is internal. That’s how do you get the right parts of the work to the right people at the right time. So let’s go back to the business model. So here’s the fledgling auto industry and Ford Motor company was one of many player. There were like dozens and dozens of car companies and very few of them survived. But the whole industry wasn’t really thriving. People would laugh at them and say get a horse, and they called it a horseless carriage because originally it looks like a carriage that was hauled around by the horse. So really the whole industry was stuck and one of the reasons was it was very expensive to buy the steel and the manufacturer of the parts, and assembled the cars. Nobody had any real competitive advantage in the business. But the worst part is that the car is financial out of reach of most of the people. To give you an example, the Ford cost about $4000 and that was by no means at the top. So that was, you could imagine somebody in the early 1900s $4000, if you look at inflation is probably about a $400,000 car at the time. So what Henry Ford did was he had an idea that if he could standardized the parts in Highland Park plant and put in a conveyor belt and he could find that, he could get the person who’s best at engines to do the engines, and the person who’s best at transmissions to do the transmissions, like all the flywheels I think in those days. A person who’s best at interiors could do all the interiors. The person who’s best at painting or exteriors could do all the exteriors. He did that and tried it for six months and within six months, they cut the time that it took to build a car. Now remember this, in this early scenario. Karla, you would build a car, you build your own parts, you’d build it yourself, and then I build my car, and I’d be sitting next to you but I would build one from beginning to end too. It took each of us about 12 and a half hours. But the rub was you were good at some things, and you’d pass me up, and then I was good at something else later on down the line and then I’d catch up to you and I’d pass you up. We’d always finish about the same place as would everybody because we all have strengths and weaknesses. So once they got the parts standardized. Once they put in a conveyor belt. Once they got one person doing each part over and over again because they’re great at it, and it was so easy for them. They cut the manufacturing time from 12 and a half hours down to one hour and 26 minutes. Allen Fahden: Yeah. That’s 8 to 1 reduction. Karla Nelson: Let alone the cost now. Because the cost now, time is money. Allen Fahden: The cost went almost proportionately down from $4000 for the car to $600 for the car so that was about an 85% reduction. Now the interesting part was what happens when you have an equal car that somebody else is selling for $4000 and yours cost $600? So all of a sudden, sales started taking off and he was able to double his workers wages against what? Once those wages were doubled, they could afford a car too. Karla Nelson: That makes me laugh. Yeah, I used to work outside of Detroit and everyone works for Ford, and you better be driving a Ford. Allen Fahden: Yeah, you better have, and when he first started working, He couldn’t have said that but they couldn’t because they couldn’t afford it. Karla Nelson: Exactly, I love it. Allen Fahden: So now they could afford it. Now interestingly enough. This is about 1912. Now what happens to the economy. Imagine this that other people start buying cars and $400 is still a lot of money and the economy starts growing and growing and of course if you have cars, well, there weren’t any roads. Well now what? We’ll build some roads. Well that employs people doing construction and they buy materials, they buy concrete and so forth. Now you got roads, well now we can travel a long ways. Well, we’re going to be too far away from home to get home for the night. Let’s build some motels. You’re hungry? Let’s build a restaurant. You need more fuel? Let’s build gas stations. The oil industry took off and flourished. So every big industry and the companies in steel industry, every big industry in the concrete started moving, and it was one of the best runs for blooming economy that the country ever had. Karla Nelson: Yeah. I think that businesses and companies focusing on the business model plus a work model because you have to have both but if you’re only focusing on the business model and externally, and you’re not utilizing that internally. I think people understand that with manufacturing now especially because of where we came and the changes we made in manufacturing and what that means. There’s trainings like lean manufacturing. Things that are specific to manufacturing basically squeezing as much as you can out of what you have to get your output. However back then 90% of businesses were manufacturing businesses. Last time I checked, it switched. So now we’re trying to do the same exact thing with intangibles because if you have a service that you’re selling, even if that service is then turning around and helping somebody purchase phone systems or whatever. The way that you adjust from being a deer company to a headlights company is a lot different in manufacturing than it is in the service space industry especially with all these new technology. I think that probably make it even challenging in the manufacturing space right now. Allen Fahden: Well, when you think about it, you have a tangible business. When you’re assembling cars that’s right in front of you, it’s very mechanical and you’re thinking can be mechanical. It’s like okay, that guy is carrying it that far, should they be carrying it over that way where it’s not as far. Very simple and very visible. Well, when you have an intangible business. You have an invisible problem set and you just solve it. Allen Fahden: Because an idea is an intangible thing. What you’re working with in a service business, when you want to make a change. Every time you want to make a change, you need to start with an idea, and ideas are still one of the most misunderstood things in business. Karla Nelson: You got it. Allen Fahden: You’re doing it from the beginning. In fact, I’m going to make a blanket statement, and that is you can have a great business model, but if you don’t have the right work model, you will never sustain it, and you’ll never realize your potential. Karla Nelson: And somebody’s going to come eat your lunch. It’s just going to happen. It’s going to happen faster. Allen Fahden: They’re going to come along with their big mean headlights and shine them in your eyes and then you’re going to be frozen in the middle of the road, not knowing what to do, and that’s what happens day in day out with businesses. Karla Nelson: Yeah. Okay. Let’s move to the next one here, and it’s our final one we’re going to talk about on today’s podcast is a deer company has meetings that waste time. Everybody’s been in this meeting. It takes forever. You get nothing done, and you round robin talking and crossing your fingers that something. Well, actually most people just get disengage in that type of a meeting versus having productive meetings. So this particular meeting as you’re using the method, you have the right kind of meeting and you identify it. Is this an ideation meeting or is it an implementation meeting? Because I would venture to say most of the times, you didn’t have to have a meeting, if you know how to run the process correctly. You just need to know who to go to. There are times you have to stop and get everybody in the room and is this ideation or implementation? So who is doing the work? A good story, Allen, for the meetings that waste time was this is actually an innovation team. They’re trying to innovate something but couple hours later. This is the best report ever I’ve ever heard, Allen, on that. We call this the story 37-36 because obviously we don’t use specific client names with the stories. Allen Fahden: Yes, well, so here’s a company. Obviously a deer company and they’re doing it the way people have always done it. So they brought everybody into the room and said we’re going to have an innovation meeting now. We need to do blah blah blah, who’s got some ideas? Somebody raise their hand and say well I’ve got an idea, why don’t we do so and so. Imagine now this is a deer company. This is an innocent little fawn. Hoisting up a balloon that’s a new idea. Suddenly this enormous buck of a deer comes racing in with 12 point antlers and punctures the balloon with the thorns. That’s pretty much what happens. It’s actually a little like skid shooting. Each time an idea in this meeting was launched, somebody would tell what went wrong with it. Well, they would say we’ve tried that before. That’s not going to work. Or somebody else would say that idea can’t work because it’s illegal in 18 states, and so what will happen is as the meeting went on and my particular job here was as a consultant to help them evaluate the meeting and see how it went, you’ll file a report at the end. We’re in there for about two hours and at the end of the meeting. Karla Nelson: Shortest report ever. Allen Fahden: After all the ideas have been launched and shot down. The guy said what’s your report? I said here it is 37 to 36. He said what. Yeah, 37 to 36. That’s my report. Well what kind of report is that? Well, 37 to 36. You wanted a report. That’s what I observed. What does that mean? Well, all you did is count the number of ideas that were launched, and then I counted the number of ideas that were shot down. It was like a skid shooting thing where you go pull, bang, pull, bang. You shoot those clay pigeons. Karla Nelson: Everybody is just so tired, they just take what they can get just because they want to get. Allen Fahden: Idea number 37, boy that was a good one. That was the one that everybody could agree on because you had nothing wrong with it. Because it was so boring and everybody done it a thousand times, and they just wanted to get out of the meeting. Karla Nelson: Juxtapose that. Go ahead. Allen Fahden: I’m just going to say and out they went. Allen Fahden: Miserable, drained, demotivated, disenfranchised. Karla Nelson: Yeah, they talk about employee engagement, people. Okay. This is the problem, okay? You can’t just say “be engaged.” Those meetings are horrible, and juxtapose that with the company that we worked with. That household name company, and they couldn’t get the safety standards for this particular company put together and it was really really important because they type of company it was, they were launching things into the sky. Allen Fahden: An aerospace company. As an aerospace company. Generally if you don’t have a standard of safety. You’re pretty much out of business. Karla Nelson: Yeah. That’s a little scary. I’m not sure the insurance company really enjoyed that. We went in and took their executive team. Put them in the right place at the right time doing the right things both in the ideation stage. We obviously went there for the implementation but they’re still using the process. They went from two years and they couldn’t figure it out. What was it? How many hours, Allen, of? Allen Fahden: We had two short half day trainings totaling about six hours. Allen Fahden: So the mover said I’m going to have, I’ve called a meeting of our engineers tomorrow at 9 a.m., and I’m going to teach them this method, and we’re going to apply it to the standard of safety, and I will let you know what happens. So he started the meeting at 9 a.m., at 10 o’clock, my phone rings, and he says we did it. Allen Fahden: It took them one hour to get a standard safety. Something they couldn’t do for two years. Karla Nelson: Yes. With 100% buy-in, everybody was happy. People support what they build and they do different parts of the work at different times. So what that means is is that you can have confidence and reliability that you have a great idea and that you can get the ideas done. I like what you call this, Allen. This is the off balance sheet asset of a company. It’s a huge asset of the company as well. So before things again that we covered over today, and being a deer company or headlights company. You have to embrace innovation or change to be a headlights company. You need to focus on role management versus function management. You need to have a work model that goes along with your business model, and you need to have productive meetings so that the outcome. Of course, we could probably go on all day here, but these are just four very big things that show up constantly over all the different verticals we’ve had the opportunity working with. So much so these are the ones that get the biggest laughs when you actually say it, because I don’t think people can believe we still do work this way. They laugh at themselves. So all right. Well, anything else you’d like to add before we sign off here, Allen? Allen Fahden: I would just say this that the number five, the confidence and probability of being able to execute new ideas is something that you could have in your back pocket as a company that’s appealing to investors, it’s appealing to customers, it’s appealing to anybody who wants to do business with you because you are going to be able to make change five to eight more times rapidly than the competition. Karla Nelson: I like that and when you view that over with the team, your client, your promoters, and you start doing that cross-channel promotion and support. It can make all the difference in the world because you’re helping them be just as successful. You’re bringing their success along with your success. Karla Nelson: Excellent. Well, thank you again for an awesome podcast, Allen. We look forward to the next time when, and remember, until then don’t be a deer company, you want to be the headlights company.